There is a place where colorful masks of feathers, fantastic outfits, mounds of beads and tons of fun can be found everyday…Eureka Springs. It is a wonderful, fantasy filled playground for tourists and residents all year long but a very special place during Mardi Gras. Eureka Springs first Mardi Gras was held in 1907. Today, opulent balls, over-the-top parades, feasts of food and jazz, risqué art shows, second line bar crawls, and the largest King Cake in the state happen in this quirky little town every year. Visit Eureka Springs in January and February for the throws, balls and fun. Watch the daytime Eureka Gras Parade wind through historic downtown Eureka Springs. In 2012, Eureka celebrates with an additional Lights & Sound Nite Parade. Eureka Gras Mardi Gras features three primary balls. Tickets are available for the Hookers & Jokers Ball (Inn of the Ozarks) and the Beaux Arts Ball (Basin Park Hotel). The Coronation Royalty Ball, held in the famous Crescent Hotel’s Crystal Dining Room, is open by invitation only. Toast the night away as you accompany the Krewe of Krazo on the Second Line Krawl. There is no better way to see Eureka Springs nightlife. View tastefully risqué art created by local Eureka Springs artists at Arti Gras. Attend the artists’ reception…complete with costumery and foolery. Krewes are the masking and parading clubs (or social organizations) that host the parades and balls. 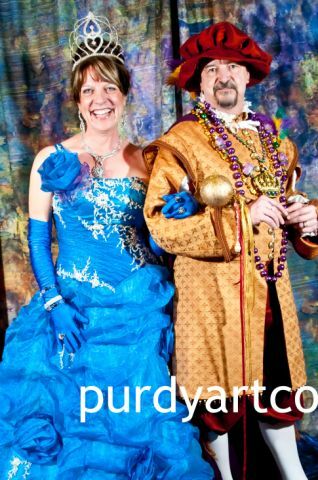 The ranking structure of a Mardi Gras Krewe is a parody of royalty: King, Queen, Dukes, Knights and Captains. The Krewe of Krazo, began with New Orleans native Dan Ellis in 2006. Most Eureka Springs Lodging offers Mardi Gras packages. Explore Eureka Springs cabins, hotels, and B&B’s. Many of the Eureka Gras Mardi Gras events happen in historic Downtown Eureka Springs. Filled with great restaurants, unique shopping and a very vibrant nightlife you might have trouble deciding what to do first. Visit the Eureka Springs Calendar of Events for a complete list of Mardi Gras events or visit the official site for Eureka Gras. Follow the Official Eureka Springs on Facebook for regular updates on Mardi Gras and other Eureka Springs Events and News or sign up for the EurekaSprings.com Newsletter. Read about Eureka Gras 2011. Tune in to The Eureka Springs Channel to see video from Eureka Springs. Watch the Coronation online! 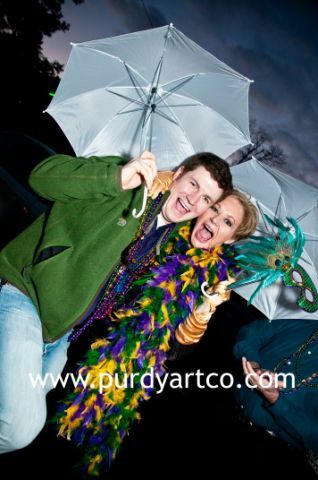 The photos in this blog are by local photographer and Krewe member, Melodye Purdy of Purdy Art Co. This entry was posted on January 20, 2012 by estcblog in Arts & Culture, Basin Park Hotel, Crescent Hotel, Culinary Adventures, Festivals, Fun Downtown, History, Musical Adventures, Things to Do and tagged Arkansas, art galleries, balls, culinary, dining, downtown, Eureka Springs, historic downtown, history, jazz, Mardi Gras, nightlife, parades, Top 25 Arts Destination.